It feels like ages since I’ve been out photographing burlesque-y people doing their thing on stage. Probably because it has been. Though next month will change all that. After a break of a year my old burly buddy Darkteaser is heading back to The Assembly in Leamington with her grand Garter Lounge show and, as ever, I’m proud to be involved as the event’s official photographer and sponsor. And Mr S has done us proud on the promotional front again. The line up looks great, with a fair few ladies I have yet to see perform – and this time around there’ll be more stalls, a late license and the opportunity to hang back and dance to the retro sounds of Mr Shellac afterwards. If you still need a bit more convincing, go and have a peek at some of the past events to see what you’ve been missing! Tickets are £16 in advance and £20 on the door so look sharp and get yours here. 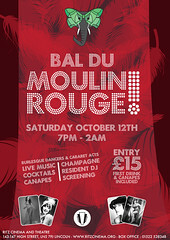 And if a big night like this happening a stone’s throw away from the studio isn’t enough, the following weekend will take me to the Missy Malone and Friends Burlesque Review, just down the road in Cheltenham. Missy’s toured her show all over the UK this year and received some fantastic reviews, so I was really flattered to be asked to come along and cover her hometown show at The Playhouse. It’s a lovely, intimate little theatre and I had a very jolly time at the last one. There are two shows on the Saturday, but they fill up quickly so don’t put it off, get your tickets from the box office on 01242 522852. I’m really looking forward to shooting at both events, not only because it’s been so long since I saw the girls, but also because this summer I’ll be holding an exhibition to show off some of the results! Warwick Open Studios (previously Warwick Arts Week) has been on the go for 12 years and is something I’ve always been keen to get involved in. So I’ve put my name down to be just one of the artists from all over Warwickshire opening their doors to the public. I dare say I’ll be plugging it some more nearer the time, but, for now, I have my artists page and lots of good intentions. Hope to see some of you at the burly shows, if we’ve not met in person be sure to tug my sleeve and say ‘Hi’.